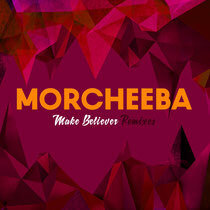 Multi-million-selling electronic music pioneers Morcheeba have just released their new single, ‘Make Believer’ from the critically acclaimed album, ‘Head Up High’ via Play It Again Sam records. The clutch of remixes for the track include UK duo Psychemagik, who are described by THUMP as “first-choice remixers that crisscross genres and scene affiliations”; and here they supply a big and bold remix that showcases their capabilities for blending vocals and electronic elements. Germany’sTimo Mass offers a deep and textured interpretation perfect for balmy summer evenings. Meanwhile, up and coming UK producer, Ben Gomori gives the original track a dance-floor ready rework with cool vocal effects and a bouncing bassline. Rounding off the package is Don La Maison, who delivers a fittingly hypnotic and sensual remix. Their eighth studio album, ‘Head Up High’ is written by all three band members, Paul and Ross Godfrey and Skye Edwards with production by Paul Godfrey. The album reflects a series of significant changes in the trio’s lives while marking the success of the band’s career spanning 18 years since the release of their debut album, ‘Who Can You’, an acclaimed trip-hop blueprint and the root of Morcheeba’s universal success and appeal having sold millions of albums worldwide. Check the single out below.